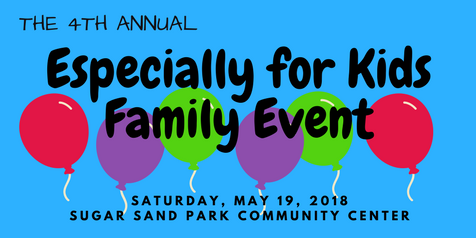 On Saturday, May 19, 2018, the 4th Annual “Especially for Kids” Family Event will be held at the Sugar Sand Park Community Center for kids with special needs and abilities and their families. This event will take place from 5:30 pm to 8:30pm, when after closing to the public, the Community Center will reopen for registered guests to enjoy exclusive, VIP, “after hours” access. The event will feature many exciting & educational activities that are guaranteed to be fun for the entire family. Activities will include exhibits from The Children’s Science Explorium, science demonstrations, glitter tattoos, arts & crafts, as well as a photo booth, dance room, and resource fair. Due to a high volume of requests from guests in years past, new this year, the event will feature an outdoor petting zoo, with accommodations for those with physical restrictions. Attendees will also have the opportunity to explore the beautifully expanded Science Garden, as well as experience carousel rides and the three-story science playground. In addition to the exciting activities available, each guest will receive food tickets for pizza and a snow cone. Registration is limited so please pre-register online at your earliest convenience, no later than one day prior to the event for all family members who would like to attend. To best accommodate the needs of guests, sound modifications will be made at the Explorium & the carousel, which is also equipped with a wheelchair lift. The Sugar Sand Park Community Center is located at 300 S Military Trail, Boca Raton, FL 33486. For more information about the event please call 561-347-3900 or visit the Sugar Sand Park Special Needs Program website.